Many years before Smoking Goat and Som Saa were whipping Londoners into a frenzy, this 19-year old restaurant, located on the first floor of the Lancaster London, was one of a tiny number of excellent places to eat Thai in the capital. Of course, this was back in the day when Thai was having its moment, just like Korean is now — but without a cult dish like kimchee for food bloggers to fetishise over and Instagram endlessly for posterity. 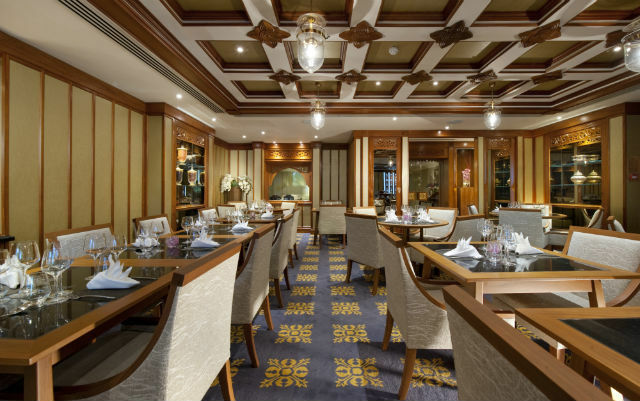 Nipa is where the Thai embassy staff dined, distinguished Thai functions were held, and the Thai government launched Thai Select — a scheme that gives approval to ‘authentic’ Thai restaurants that uphold high culinary standards. (To be honest though, the award isn’t, as far as we can tell, particularly consistent, meaningful or influential.) Then the restaurant closed for refurbishment for several weeks last summer, officially re-opening in November 2014. At a first glance, not much seems to have changed. It still rocks a corporate-chic look of teak wall panels, airport-lounge patterned carpets, and sombre Thai carvings and ornaments. A coveted dining area on a raised platform by the window still overlooks the Italian Gardens in Hyde Park. Livening up the sedate interior are artworks depicting Thai Buddha, gold wallpaper, silk fabrics and oriental-design glass lamps. The ceiling and walls are different, now decorated with striking carved teak lotus motifs. There are new, somewhat cumbersome black granite dining tables and cream silk chairs. Like the adjoining hotel lobby bar where we kicked off the evening with a drink, it looks far from trendy — or welcoming. So it’s just as well, then, that the food is worth travelling for. Sanguan Parr, who’s been working here in different roles for the past 16 years, is now the head chef. Her kitchen’s had a complete re-fit, and she has an all-female brigade (unusual for any restaurant kitchen, let alone a Thai one). Parr has made only a few changes to the menu, which includes classics from northern Thailand and specialities from the central region. Curiously, in the vegetarian section, there’s little distinction in prices (or portion sizes) between starters, mains and side dishes, all of which uniformly cost between £10-£12. Som tam — shredded green papaya salad with long beans, cherry tomatoes and chopped peanuts — almost knocks us sideways with its pervasive fieriness. It’s a vivacious, refreshing dish, with enough tang and sweetness to balance the chilli heat. Larb hed — little sliced button mushrooms with chillies, shallots, Thai parsley, fresh mint and lettuce — is just as distinctive, but with a mellower bright, verdant flavour. Little spring rolls with glass noodles, cabbage and mushrooms are fairly standard though, and the accompanying dipping sauce (probably from a bottle) didn’t set our pulses racing like the other two curtain-raisers. Next, Thai omelette with preserved turnips, chilli and basil, is somewhat over-cooked and less interesting than it sounds, but its sweetish taste is a good foil to other, more vibrant dishes. Stir-fried beancurd with mushrooms, chillies and basil, on the other hand, is more exciting than it looks on paper: the beancurd pieces have a honeycomb texture, and the umami-packed sauce has depth and complexity. Sweet, aromatic coconut and pandan rice is a perfect accompaniment to the intensely savoury and robustly flavoured dishes. Pretty carved vegetable garnishes, and the liberal use of green foliage, fresh herbs and red chillies, makes the food taste like a tropical garden — one in which, despite the incongruousness of its buttoned-up surroundings, a wild party is in full swing. However, there’s a paucity of fresh vegetable side dishes on the menu: we didn’t want to order generic ‘stir-fried vegetables’ or out-of-season asparagus. We were also keen to avoid clichés such as sweetcorn fritters, tom yum soup and green curry that make up the rest of the veggie menu. (There’s more variety on the very extensive non-vegetarian list, however.) Staff, who’re lovely, confirmed that the meat-free dishes contain no fish sauce or shrimp paste, and only vegetable stock or water are used. The only real disappointment is the desserts. We’re told that the coconut ice cream is bought-in; and are discouraged from ordering ‘carved Thai exotic fruits’ — top-quality Thai fruit being some of the most sumptuous and delicious in the world. Passion fruit and lemongrass-baked custard tastes a bit stale, and has an odd glazed look and gummy texture of a dish that’s been sitting around too long. The scoop of accompanying Valrhona chocolate sorbet tastes thin, bland and cheap; and the advertised ‘ginger shortbread’ turns out to be… well, just a pattern of biscuit crumbs on the plate: surely taking ‘deconstruction’ too far? ‘Deep-fried ice cream’ — a doughnut-like ball of batter-coated, fried vanilla ice cream — isn’t particularly exciting either, but is much better. We paid around £45-£50 each including cocktails in the bar before our three-course dinner, a couple of glasses of Monsoon Valley Thai wines, service — and an inexplicable 20% discount “for people who book online” (we insisted we didn’t, but the discount seemed to apply to all diners who'd pre-booked). 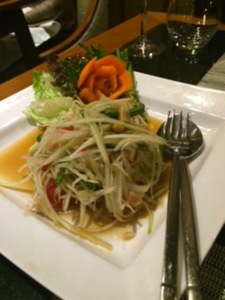 There’s also a vegetarian set menu for £35 per person for a minimum of two people, or £55 with matching Thai wines. If the food at Nipa were the end result of a month-long pop-up by a tattooed, Twitter-savvy Shoreditch chef, it would have Instagrammers queuing up with their cameras poised. Instead it’s a mostly-shiny culinary pearl, hidden amid conservative surroundings in an unfashionable location that has withstood the test of time. Thank goodness for small mercies. 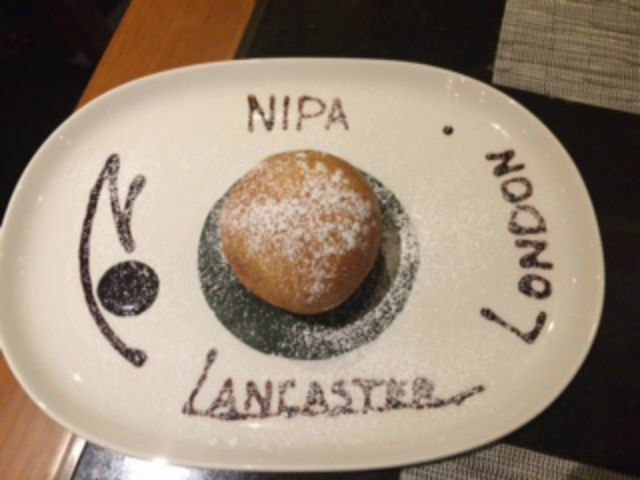 Nipa Thai, Lancaster London Hotel, Lancaster Terrace, W2 2TY. Tel: 020 7551 6039. We review strictly anonymously, and pay for all the food, drink and service. Restaurant images kindly supplied by Nipa Thai. Food images courtesy of Sue Haddleton.